The 1970s will forever be remembered for shag carpet, avocado green everything, disco, and of course, the 1976 Bicentennial Celebration. Throughout ‘The Good Doctor’s Collection’ are a wide variety of ephemera that helps to bring us back to the far out days of the 1970s and the 1976 bicentennial anniversary. By looking at the bicentennial celebration through ephemera, we can see how both groovy Americans and the companies that catered to them ‘sell-abrated’ this year-long anniversary. 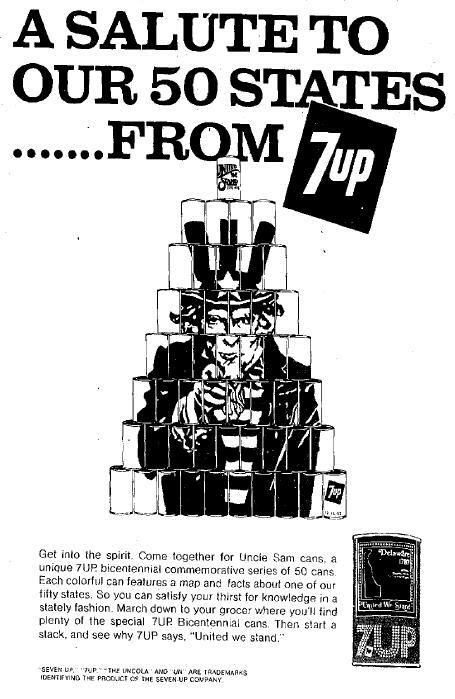 The item chosen from the collection for this blog is the ‘United We Stand’ 7 Up soda-can collection – one of the largest collections of the archive. It took almost an entire year of both purchasing and dumpster diving to complete this very American collection. 7 Up, the lemon-lime soda pop we have all come to know and love, has been around since the early 1930s. Then called Bib-Label Lithiated Lemon-Lime Soda, it would not become 7 Up until 1936. By the 1940’s, 7 Up had become the third largest selling soda pop on the market, according to the Dr. Pepper Snapple Group, the current owners of the 7 Up brand. Besides releasing special glass bottles in 1976 to mark the occasion of the United States Bicentennial, 7 Up released its ‘United We Stand’, aluminum can collection. This was one of two fifty-can 7 Up can collections released that decade – the other being ‘States Turning 7 Up’, released in 1979. 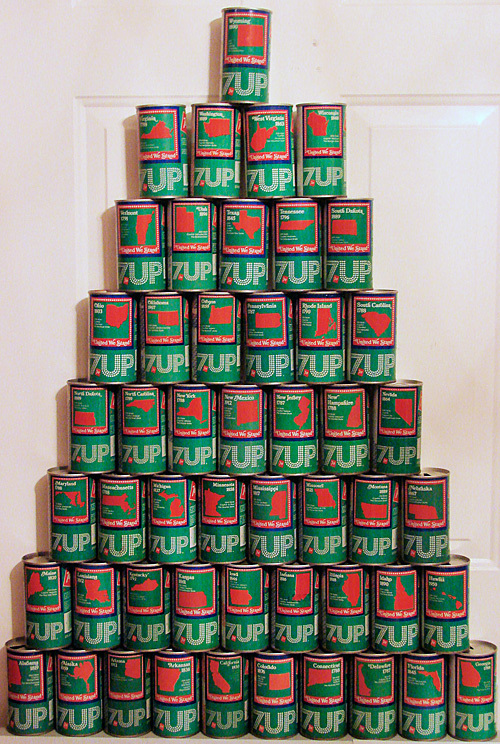 At the time of the collection’s release, 7 Up was the only soda company to market an entire aluminum can collection of this type. Its parent manufacturers, Pepsi Cola Co., had released commemorative glass bottles celebrating the country’s anniversary, but no other soda brands had released a can collection of this magnitude. 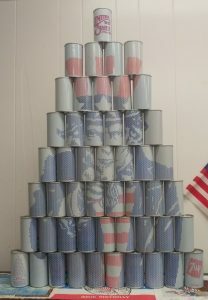 With the ‘United We Stand’ can collection, each State’s soda can, Beginning with the instructions for the design plan on Can #1 and ending with the ‘United We Stand’ logo on Can #50, could be collected and stacked to create an image of the famous I-Want-You Uncle Sam image from the propaganda poster of 1917. 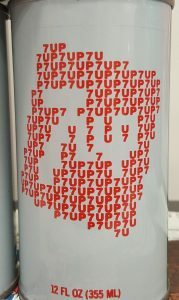 The image of the design was created by repeating use of the word ‘7 Up’ in two colors – either red or blue, leaving the background of the decorative side of the can to be white. Each State’s soda can also shared three facts from each State. Florida’s state facts, for example, are that it’s the twenty-seventh state in the U.S., its state capitol is Tallahassee, and its state nickname is ‘The Sunshine State’. This marketing strategy for the ‘uncola’ soda, would be used again in 1979 with the ‘States Turning 7 Up’ collection – another assortment of fifty cans for fifty states that could be gathered and stacked to share an image – this time the picture of the country itself, the United States. No other soda company has released a collection likes these since, though they have done so on much smaller scales. Today, many soda can collectors are still collecting this large and very American assortment of 7 Up cans. Through websites such as eBay and soda can forums, collectors have looked sometimes for years for individuals cans missing from their collection – one can only imagine the work it took for a person in 1976 to attempt to collect this great American treasure.